Richard Page of UME Toys has created his very own addition to the Madball universe with this Star Wars inspired Scum and Villainy Wretched Ball resin figure! 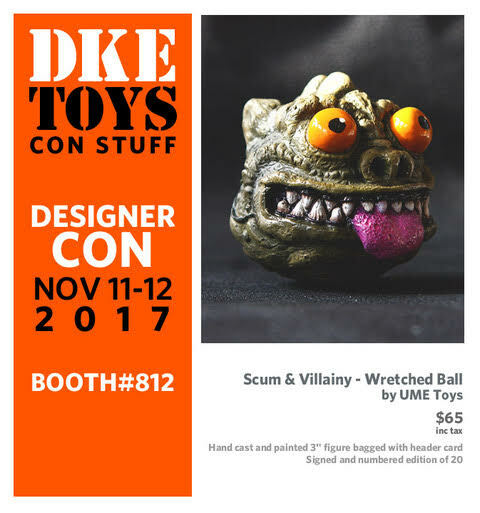 Evoking the image of everyone’s second (or is it third) favorite bounty hunter Bossk, each Designer Con 2017 Exclusive Wretched Ball 3” resin figure is hand cast and painted by the artist. Bagged with a header card, this awesome new signed and numbered figure is limited to 20 pieces and can be purchased at the DKE Toys DCon booth #812 for $65.